1. Stockings Hung from Ribbon on the Staircase- No mantel to hang the stocking from? No problem. 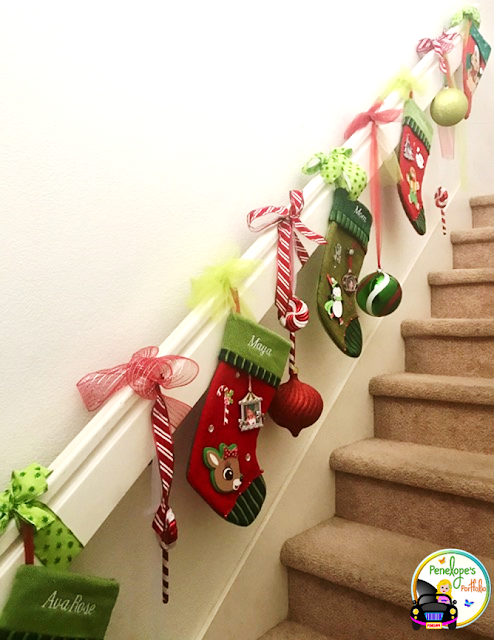 Why not hang the stockings from the stair railing? At first, I thought I would use garland, but then I realized, I no longer owned any Christmas garland. So I grabbed a handful of decorative ribbons and tulle from my Christmas bin in the garage, and got to work! In between the stockings, I hung large ornaments or Christmas decor. 2. Santa Wreath- I needed something for my front door, and was inspired to make a crafty Santa looking wreath, but I didn't have all the materials needed to make the wreath, so the base of the wreath was made from a large cardboard circle that I cut out from an old unused box. I covered the circle in tulle, and stapled pieces of rolled up tulle onto the wreath. I used an old belt that no longer fit my son for Santa's belt, (but I may update this in the future with a more "Santa looking" belt). 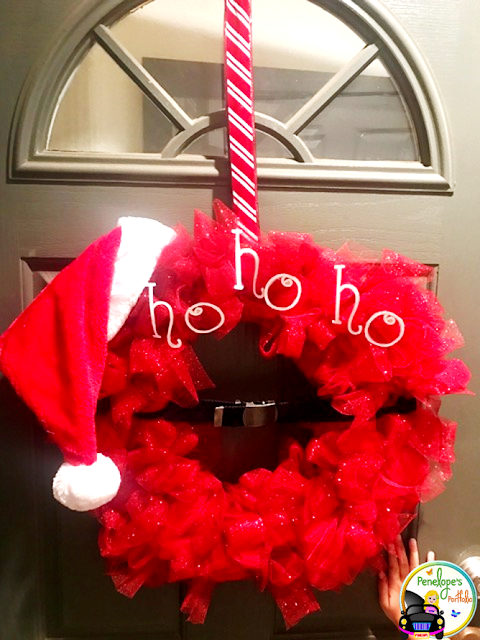 I printed out "ho ho ho" on glossy photo paper, cut out the letters, and hot glued them to the tulle. I finished the look with a Santa's hat that I happened to have on hand, and hot glued it to the tulle. 3. A Collage of Santa Pictures- I found a holiday photo book that was being unused, and decided to give it a use, (but any frame that holds multiple pictures would work for this project). I printed out pics that my kids took with Santa throughout the years, and placed them in the book. I used stickers in the shape of small red strips, to divide existing photo frames into smaller sized photo frames, which accommodated for all the years needed. To finish the project, I used number stickers, and a permanent marker to mark each year the picture was taken. 4. Life-Size Advent Calendar- Ok, this project was a bit more complex, was actually completed the previous weekend, and did involve a shopping trip, but it was still resourceful and budget friendly! 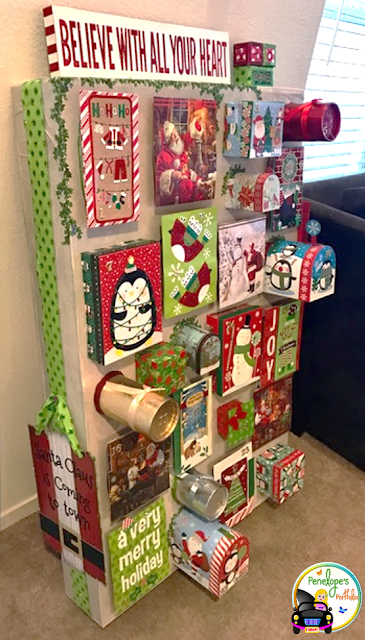 It involved using an old TV box, dollar store gift boxes, gift bags, greeting cards, ribbon, and holiday signs. To see full tutorial, click here. 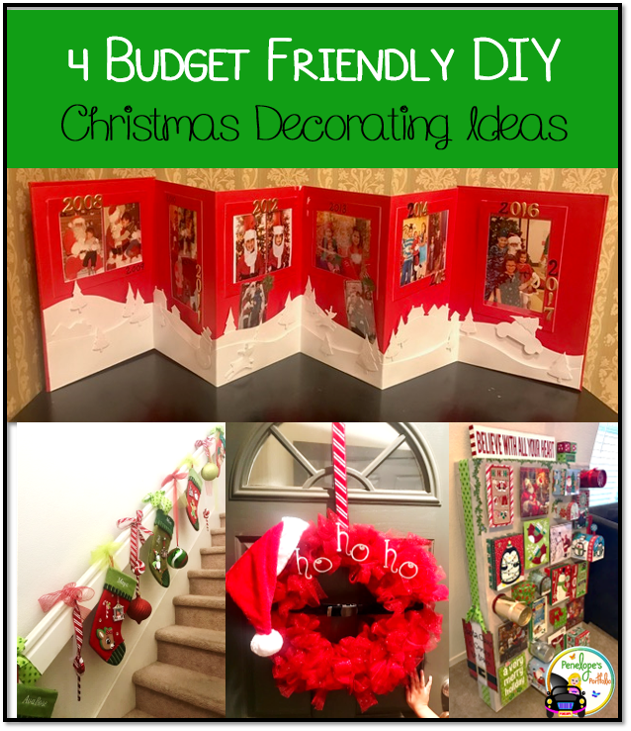 And those are my budget friendly DIY holiday decorating ideas. Hope you enjoy them! 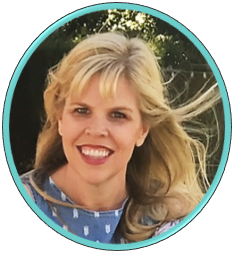 I'd love to hear about ideas of your own. What are your favorite ways to decorate for the holidays?